Not all existing railways are ideal for automation and may need significant upgrades. Nevertheless, automation has considerable benefits for safety and performance and can offer better throughput of trains of up to 8% just by the elimination of manual driving variability. The automation of train movements was gradually developed from the need to enforce signal commands so that drivers could not allow trains to pass beyond their limit of movement authority (LMA). We discuss this further in our Train Protection page. The automation of train control was developed from there, using advances in traction control, which gave automatic acceleration and in braking, which could incorporate electrical control and automatic load compensation. Originally, in Britain, the letters ATC referred to "Automatic Train Control", which was the title given to the warning system tried on some UK lines before the general introduction of the AWS (Automatic Warning System) in the 1960s. In the US it also refers to Automatic Train Control but it refers to a more modern concept where the system includes ATP (Automatic Train Protection), ATO (Automatic Train Operation) and ATS (Automatic Train Supervision). ATC has been adopted around the world to describe the architecture of the automatically operated railway. It is usually applied to metros. In this article we examine several different automatic train concepts. As a definition, ATC refers to the whole system which includes all the other automatic functions and, for some of these functions at least, also includes a degree of manual intervention. ATC therefore, is the package which includes ATP, ATO and ATS. Victoria Line Resignalling - IRSE News 142 Feb 2009 p.8. 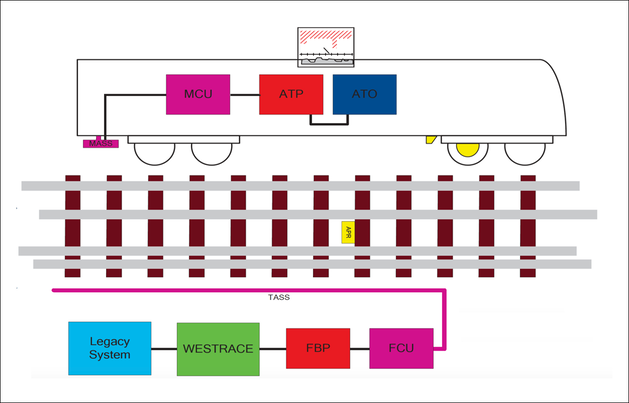 The first part of the package of an ATC system is Automatic Train Protection (ATP), where the train is given a Limit of Movement Authority (LMA). This is based on the train’s current speed, its braking capability and the distance it can go before it must stop. On a manually driven train, the driver manages this through a combination of route and stock knowledge and the visual information received from wayside signals. On the automated train, the data for the LMA is transmitted from the track to the train where the on-board computer registers the current speed and calculates the target speed that the train must reach and by when. This is electronically plotted in the form of a braking curve. If the train is allowed to exceed the profile of the curve, the brakes will automatically apply to bring the train to a stand (or at least to within the permitted speed). The second part of an ATC system is Automatic Train Operation (ATO). This is the driving part of the operation. Looking at a manually driven train, we will see that the driver initiates the starting of the train, allows its acceleration to the permitted speed, slows it where necessary for speed restrictions and stops at designated stations in the correct location. The ATO system will carry out these parts of the operation with the exception that the driver normally initiates the train start. There are a number of different systems used to perform the ATO functions but they all involve data communication between the train and the train and most require some form of on-board route map. There are a number of ways to assemble the parts of an ATC package but a common format appears as in Figure 1. 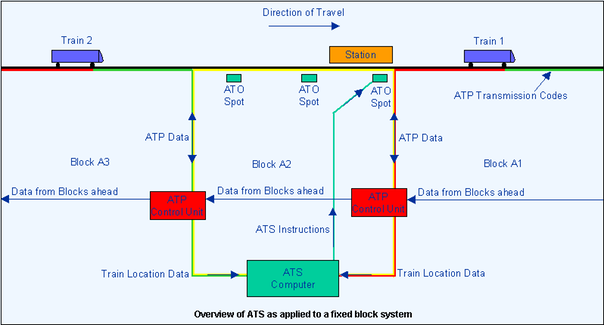 Figure 1: A schematic showing the basic architecture of a fixed block automatic train control (ATC) system with its three main components - ATP (Automatic Train Protection), ATO (Automatic Train Operation) and ATS (Automatic Train Supervision). The data received by the ATP control unit is usually limited to indicating that a train is in the block or the speed limit currently imposed in the block. This data is sent to the ATS computer where it is compared with the timetable to determine if the train is running according to schedule or is late or early. To adjust the train's timing, the ATS can send commands to the ATO spots located along the track. The ATO spots, which can be short transmission loops or small boxes called beacons or "balises", give the train its station stop commands. The spots usually contain fixed data but some, usually the last one in a station stop sequence, transmit data about the time the train should stop (the dwell time) at the station and may tell it how fast to go to the next station (ATP permitting). Some systems leave the ATO spots alone - i.e their data is always fixed - but use the ATP system to prevent the train from starting or restrict its speed. The ATS computer tells the ATP control unit to transmit a restricted speed or zero speed to the track. Both ATP and ATO commands are picked up by receivers on the train and translated into motoring, braking or coasting commands. Where a train can be manually driven, the ATP will still ensure the safety requirement but the ATO is overridden, the driver stopping the train in the stations by use of the cab controls. There are lots of variations of ATC around the world but all contain the basic principle that ATP provides safety and is the basis upon which the train is allowed to run. ATO provides controls to replace the driver, while ATS checks the running times and adjusts train running accordingly. If a line is equipped with a simple ATP system which automatically stops a train if it passes a red signal, it will not prevent a collision with a train in front if this train is standing immediately beyond the signal. Figure 2: Diagram showing a signal provided with an overlap. The overlap on British main lines was originally based on statistics showing how far a train would overrun in misjudging the stop at a signal. On the London Underground they were calculated for each location. Other railways use a complete block as a safety margin. There must be room for the train to brake to a stop - see the diagram above. This is known as a "safe braking distance" and space is provided beyond each signal to accommodate it. In reality, the signal is placed in rear of the entrance to the block and the distance between it and the block is called the "overlap". Signal overlaps are calculated to allow for the safe braking distance of the trains using this route. Of course, lengths vary according to the site; gradient, maximum train speed and train brake capacity are all used in the calculation. In the US, the overlap is considered so important that a whole block is provided as the overlap. It is referred to as "absolute block". This means that there is always a vacant block between trains. It's rather wasteful of space and it reduces capacity but it saves the need to calculate and then build in overlaps for each signal, so it's cheaper. Like a lot of things in life, you get what you pay for. Much of the development effort in the area of new signalling systems is concentrated on removing reliance on track-based equipment. Generically, this type of technology is referred to as Communications Based Train Control (CBTC) and is broadly similar to ETCS Levels 2 or even 3 in as much as conventional track circuits are not necessarily required for train detection. Where trains do not report their own location using tachometers, Doppler radar and balises, detection can be provided additionally by combinations of track circuits, or by means of Global Positioning by Satellite (GPS) or Global Navigation Satellite Systems (GNSS) as they are now called. Some systems reduce or eliminate the need for fixed track based systems like track circuits and axle counters and rely instead on a combination of train borne speed and location data together with balises and GNSS. Some CBTC systems use radio-based data bearers to transmit train locations to the central control computers. These are now being used on some metros and people-mover systems like the Las Vegas Monorail. However, some track-based data is still usually considered essential in locations where track separation for parallel tracks and turnout (point) locking is required. In the US, systems using GNSS are being introduced as part of the federal requirements to introduce Positive Train Control (PTC) over 60,000 miles of railroads. The complexity of installing PTC is further complicated by the fact that there are 10 different systems in use across the US. The Federal Railroad Administration (FRA) lists the types in their PTC Systems Page and shows progress on their PTC Overview Page. It should be noted that some of the systems using satellite links for train separation were designed in the first instance for areas of "dark territory" where line-side signals are not provided and trains are controlled by train orders and track warrants. The CBTC systems are used to increase throughput and crossing point efficiency whilst not reducing safety. There is value in considering such systems for use in the UK, particularly where remote routes with low train frequency might have to be closed without a reduction in infrastructure replacement and maintenance costs. GNSS based systems can also be used for passenger information both on trains and at stations. A further possibility for the use of GNSS is to trigger the warning on the approach to a level crossing with a constant-time lapse regardless of the speed of the train. In a similar way, track workers could be alerted to the approach of a train within a known fixed time. The Westinghouse Rail Systems (now Siemens) DTG-R (Distance To Go - Radio) system installed on the London Underground’s Victoria Line is the first instance of a full ATP application using radio-based data bearers in the UK. The system is based on fixed block train detection with vital radio data transmission between each interlocking area and the train. It operates in conjunction with ATO and replaced the induction based transmission system originally used on the line. Figure 3: Schematic diagram showing the DTG-R system introduced on the Victoria line in London in 2009. The track to train communication system is radio using the Fixed Communications Unit (FCU) trackside and the on-board Mobile Communications Unit on the train. Transmission is through the trackside antenna (TASS) and the aerial on the train (MASS). The system was overlaid on the legacy system and interlocking data generated by the Westrace system passed to a Fixed Block Processor (FBP). Updates to the on-board map are provided by the Absolute Position References mounted on the track at regular intervals. Diagram IRSE. The line is divided into what Westinghouse engineers referred to as "interlockings" even where only plain line is provided. An interlocking usually covers a station and the tracks halfway to the next station. Block occupancy data is collected by the Westrace interlocking and passed to a Fixed Block Processor, which converts the data into a radio message. The radio message transmits the block occupancy and proceed status to the train. Geographical data on the line profile and Permanent Speed restrictions (PSRs) is carried on the train. Train positioning is updated by track-mounted balises called Absolute Position References (APRs). Trains operate under ATO but are capable of operating under full ATP protection with manual driving. The ATO system is similar to the existing Central Line installation using loops known as Platform ATO Communication (PAC) loops. The failure mode restricts manual driving on sight to 10 mile/h. There are a considerable number of technical and operational problems to be overcome before installation of ETCS compatible ATP and migration towards full operation of ATP on the running railway can be achieved. Promoters of any future legislation must be aware of these and of what can be done realistically before any new regulations are introduced. The issues listed below will affect the credibility of those affected as well as the regulators themselves. •	Signal engineering skills shortages. Using lessons learned from previous introductions of new train protection systems, both in the UK and continental Europe, there is an opportunity for the approvals process required for new ATP systems to be implemented smoothly and such systems to be deployed rapidly. Operators, owners, suppliers and installers should be encouraged to interface with the regulatory authorities as early as possible. In looking towards future developments, there is a risk that accepted standards in place today will reduce the drive to improve and develop new systems because of changes required to existing standards. The process of changing and getting approval for compliance with new standards could act as a deterrent to improvements unless standards are carefully written to allow improvements. It is a widely held view in the industry that the introduction of ATP will reduce line capacity. This is not necessarily the case in all areas and there are positive benefits from the use of ETCS Level 2/3 in terms of train throughput. In simple terms, a train’s speed on the approach to the block will have to conform to the safe braking distance profile. However, there is no reason why ECTS Level 2 should not be capable of supporting the existing capacity and, indeed, improving on it using shorter fixed blocks. As it does not require fixed blocks, Level 3 will improve capacity in most areas. It is recommended that a group with a mandate to address lessons learned by both UK and overseas organisations concerned with the design, manufacturing, testing, commissioning, approval and operation of ETCS should be set up and maintained to act as a reservoir of knowledge and experience with the objective of reducing the problems associated with the implementation of new and enhanced ATP systems. There will doubtless be some rolling stock whose age precludes a cost-effective case for fitting new ETCS equipment and which will continue to operate with legacy equipment. Any railway signalling developments proposed for the next 10 years will depend on the availability of suitable engineering and installation skills. A large proportion of the relevant UK skills base will be absorbed by the London Underground PPP contracts that cover the re-signalling of over 300 route-km of London Underground lines in the period 2006 to 2017. The equipment to be supplied is novel, ATP based throughout, with complex performance requirements and is still in development. Existing skills shortages in the UK are forcing the contracting companies to source part of the project staff from overseas. Modernisation of the UK main line signalling infrastructure with ETCS based equipment will require similar skills. Shortages, if not addressed immediately, are likely to slow down all replacement programmes. Many of these processes will have to change significantly compared with existing practices and will, during the migration periods, have to be run in parallel with them. These circumstances could cause serious delays to train operations or present significant safety risks and should be included in any assessments carried out to determine the methods for introducing ATP. In particular, the man-machine interface must not be forgotten. The success and acceptance of ATP systems will depend to a substantial extent on drivers’ ability to understand and act upon the normal operational modes and failure modes possible with complex ETCS and similar ATP systems. Areas for further exploration concern the man-machine interface, the requirements for revoking authority (replacing signals to danger) and driver supervised movements. To provide complete protection, any ATP system adopted will have to incorporate some form of roll-away detection, including roll-back. If this is to be fitted to existing rolling stock, further interface issues will have to be resolved. In any ATP system, the requirement to impose temporary or emergency speed restrictions (TSRs and ESRs) must be considered. In theory, this would seem simply a matter of placing a passive balise on the approach to the speed restriction with its required speed suitably pre-programmed. However, the issue of gradient effects and how this would be calculated and programmed into the balise must be considered. The quality control of such programming is vital and suitable methodologies must be agreed and monitored. In any case, there is a need to stipulate a standard default mode for temporary balises. •	Retrofitting to existing rolling stock. Looking at the existing installations of signalling equipment, both at the line side and on rolling stock, it is likely that new ETCS equipment will have to operate alongside existing systems for at least 30 years. There are a considerable number of issues related to the effects of failures and the resulting degraded modes of operation. A careful balance must be found between ensuring train movements can continue whilst risk is minimised when operating trains under degraded modes of ECTS and other advanced forms of train protection. Degraded modes will include the initiation of a brake application by the equipment because of driver error as well as equipment malfunction. A clear distinction should be made between the two but it may be necessary to impose operating rules that assume driver error even in the event of equipment failure. Detailed studies and consultation with regulators and operators are required to ensure the correct rules are understood and agreed prior to equipment installation. A range of speed limit values for a train protection system, e.g., maximum speeds for different blocks, supervision and intervention speeds [Woodland, 2005], a brake release speed, a shunt speed, a non-supervised speed, a rollback speed, a reverse speed, an on-sight speed etc., will lead to a complex matrix of controls and rules which will lead to poor reliability and possible driver or maintainer confusion. Basic speed limits will have to be imposed in the event of equipment failure but these should be limited in number and should cover reversing moves, shunting on ATP lines, coupling and uncoupling and recovery modes where possible. All ATP systems fitted to trains operating over open areas of railway infrastructure will be subject to the effects of degraded adhesion from time to time. This is a particular problem in the temperate UK climate and has led to a number of attempts to mitigate the effects on train braking. A number of strategies have been adopted, ranging from reliance on techniques such as "defensive driving", to sanding and to operating in protected manual mode on ATO metro lines. The Ebicab system allows drivers to input a "poor adhesion" rate when setting up the train for initialisation prior to entering service. Swiss railways use a special code of ETCS to achieve the same objective [Watson, 2003]. This issue must be addressed in respect of both technology and operating rules when introducing ATP. The use of GSM-R radio for vital data transmission is still regarded throughout the railway industry as either "not fully proven" or "insufficiently reliable" for permanent, full-time operation. Railway administrations, both national and commercial, presently regard the use of radio transmission without a fixed block, visual line side signal back-up system as unacceptable from a reliability perspective. The questions raised about the reliability of GSM-R or GNSS technology and its availability might be answered by the use of two-tier systems or independent, parallel systems being used. One of the main advantages of ETCS Levels 2/3 is that line-side signals can be removed and that a considerable rationalisation of line-side equipment can be achieved. This is expected to reduce installation and maintenance costs and to improve the life cycle costs. If back-up systems are retained, most of these benefits will be lost and costs will probably rise. This is likely to lead to failure to secure a business case for the viability of ETCS Levels 2/3 installations under existing cost/benefit analysis conditions. To overcome this problem, the reliability of the radio system must be improved and the methods for recovery from failures must be designed carefully to minimise loss of capacity. In the meantime, experience with the Swiss trial of ETCS Level 2 shows that back-up line-side signalling system should be retained at least during the implementation and stabilisation phases of a project. We have seen in the previous articles that the ATP signalling codes contained in the track circuits are transmitted to the train. They are detected by pick-up antennae (usually two) mounted on the leading end of the train under the driving cab. This data is passed to an on-board decoding and safety processor. The permitted speed is checked against the actual speed and, if the permitted speed is exceeded, a brake application is initiated. In the more modern systems, distance-to-go data will be transmitted to the train as well. The data is also sent to a display in the cab which allows the driver of a manually driven train to respond and drive the train within the permitted speed range. At the trackside, the signal aspects of the sections ahead are monitored and passed to the code generator for each block. The code generator sends the appropriate codes to the track circuit. The code is detected by the antennae on the train and passed to the on-board computer. As we have seen, the computer will check the actual speed of the train with the speed required by the code and will cause a brake application if the train speed is too high. In the examples so far, the ATP data from the track to the train is transmitted by using coded track circuits passing through the running rails. It is known as the "continuous" transmission system because data is passing to the train all the time. However, it does have its limitations. There are transmission losses over longer blocks and this reduces the effective length of a track circuit to about 350 metres. The equipment is also expensive and vulnerable to bad weather, electronic interference, damage, vandalism and theft. To overcome some of these drawbacks, a solution using intermittent transmission of data has been introduced. It uses electronic beacons placed at intervals along the track. In the best known system, originally developed by Ericsson in Sweden and formerly marketed by Adtranz (now Bombardier), there are usually two beacons, a location beacon to tell the train where it is and a signalling beacon to give the status of the sections ahead. The beacons are sometimes referred to as "balises" after the French. Data processing and the other ATP functions are similar to the continuous transmission system. The beacon system operates as shown in the simplified diagrams below. In the diagram (left), the beacon for red Signal A2 is located before Signal A1 to give the approaching train (2) room to stop. Train 2 will get its stopping command here so that it stops before it reaches the beacon for signal A3. In the diagram on the left, the train has stopped in front of Signal A2 and will wait until Train 2 clears Block A2 and the signal changes to green. In reality, it will not move even then, since it requires the driver to reset the system to allow the train to be restarted. For this reason, this type of ATP is normally used on manually driven systems. A disadvantage of the beacon system is that once a train has received a message indicating a reduced speed or stop, it will retain that message until it has passed another beacon or has stopped. This means that if the block ahead is cleared before Train 2 reaches its stopping point and the signal changes to green, the train will still have the stop message and will stop, even though it doesn't have to. Why, might you ask, can't the driver cancel the stop message like he does when the train has stopped and the signal changes to green? If he could cancel the stop message while the train was moving, the system would be no better than the AWS with its cancel button. ATP is "vital" or "fail-safe" and must not allow human intervention to reduce its effectiveness. To avoid the situation of an unnecessary stop, an intermediate beacon is provided. This updates the train as it approaches the stopping point and will revoke the stop command if the signal has cleared. More than one intermediate beacon can be provided if necessary. As signalling technology has developed, there have been many refinements to the block system but, in recent years, the emphasis has been on attempts to get rid of fixed blocks altogether. Getting rid of fixed blocks has the advantage that you can vary the distances between trains according to their actual speed and according their speeds in relation to each other. It’s rather like applying the freeway rules for speed separation - you don’t need to be a full speed braking distance from the car in front because he won’t stop dead. If you are moving at the same speed as he is, you could, in theory, travel immediately behind him and, when he brakes, you do. If you allow a few metres for reaction time to his brake lights and variations in braking performance, it works well. Although it only needs a few spectacular collisions on the freeways to disprove the theory for road traffic, in the more regulated world of the railway, although it could not be applied without a full safe braking distance between trains, it has possibilities. As long as each train is travelling at the same speed as the one in front and they all have the same braking capabilities, they can, in theory, run as close together as a few metres. Just allow some room for reaction time and small errors and trains could run as close together as 50 metres at 50 km/h. Well, that’s OK in theory but, in practice, it’s a different matter and, as yet, no one has taken moving block design this far and they are unlikely to do so in the near future. The recent ICE high speed accident in Germany where a train derailed, struck a bridge and stopped very quickly, effectively negates the safety value of the theoretical moving block system described above. This means that it is essential to maintain a safe braking distance between trains at all times. What is worth doing, is making the the block locations and lengths consistent with train location and speed, i.e. making them movable rather than fixed. This flexibility requires radio transmission, sometimes called Communications Based Train Control (CBTC) or Transmission Based Signalling (TBS) rather than track circuit transmission, to detect the location, speed and direction of trains and to tell trains their permitted operating speed. On a moving block equipped railway, the line is usually divided into areas or regions, each area under the control of a computer and each with its own radio transmission system. Each train transmits its identity, location, direction and speed to the area computer which makes the necessary calculations for safe train separation and transmits this to the following train as shown here (left). The radio link between each train and the area computer is continuous so the computer knows the location of all the trains in its area all the time. It transmits to each train the location of the train in front and gives it a braking curve to enable it to stop before it reaches that train. In effect, it is a dynamic distance-to-go system. This is Communications Based Train Control (CBTC). One fixed block feature has been retained - the requirement for a full speed braking distance between trains. This ensures that, if the radio link is lost, the latest data retained on board the following train will cause it to stop before it reaches the preceding train. The freeway style vision of two trains moving at 50 km/h with 50 metres between them is a step too far into virtual reality for most operators. As we have seen, trains in a moving block system report their position continuously to the area computer by means of the train to wayside radio. Each train also confirms its own position on the ground from beacons, located at intervals along the track, which recalibrate the train’s position compared with the on-board, computerised line map. Transferring a train from one area to another is also carried out by using the radio links and, additionally by a link between the two adjacent area computers. The areas overlap each other so, when a train first reaches the boundary of a new area, the computer of the first area contacts the computer of the second area and alerts it to listen for the new train’s signal. It also tells the train to change its radio codes to match the new area. When the new area picks up the ID of the train it acknowledges the handover from the first area and the transfer is complete. Another version of the moving block system has the location computers on the trains. Each train knows where it is in relation to all the other trains and sets its safe speeds using this data. It has the advantage that there is less wayside equipment required than with the off-train system but the amount of transmissions is much greater. The Seltrac system requires no driver, as it is fully automatic. In case of a system failure where a train has to be manually driven, it has axle counters to verify the position of a train not under the control of the loops. Perhaps its biggest drawback is the need for continuous cables to be laid within the tracks, expensive to install and open to damage during track maintenance. The principle difference between this system and the more modern ones being marketed today is that Seltrac uses electro-magnetic transmission of data requiring track cables, whereas radio based systems only require aerials. Seltrac is upgrading their design to use radio based transmission. Moving Block - Why Do We Need It? Railway signalling has traditionally required a large amount of expensive hardware to be distributed all along a route which is exposed to variable climatic conditions, wear, vandalism, theft and heavy usage. Because of the widely spaced distribution, maintenance is expensive and often restricted to times when trains are not running. Failures are difficult to locate and difficult to reach. On metros, access is further restricted where there are tunnels and elevated sections. For these reasons, railway operators have been trying to reduce the wayside signalling equipment and so reduce maintenance costs. Reduced wayside equipment can also lead to reduced installation costs. Moving block requires less wayside equipment than fixed block systems. There is another goal much sought after by operators - greater capacity. A norm for most metro lines is 30 trains per hour (tph) or a two-minute headway. It is debatable whether much improvement on this is possible for a high capacity system, since the major losses of line capacity occur because of station stops and terminal operations. Heavily used metro lines, like those in Hong Kong, trying for a greater capacity than 30 trains per hour, will struggle to keep dwell times below 40-50 seconds at peak times. This will push the headway to two minutes or longer, regardless of the signalling system used. Similar problems exist at terminals where crossover clearance times are critical. Moving block signalling cannot provide much improvement. Shorter headways can, however, be achieved on systems where trains are shorter, speeds lower and the passenger levels smaller. In some places a 95 second headway can be achieved on systems like Docklands and certain sections of the Paris Metro. Also, for underground lines, modern ventilation and smoke control systems will require train separation of 2-300 metres to allow air circulation at critical times. If moving block signalling allows 50 metre separation, some very expensive additional ventilation arrangements might be necessary. This may reduce the benefits of moving block. The real prize which could be won by an operator using moving block is reduced wayside equipment and reduced maintenance costs. Better reliability and quicker fault location is also possible with moving block technology. If radio based transmission is included, an all-round improvement can be achieved. One other factor to be noted is that many operators specifying moving block technology also ask for fixed block track circuits to serve as a back up and for broken rail detection. Track circuits are also still required for junctions. One might ask, if such equipment is to be installed anyway, why add the expense of radio-based transmission?